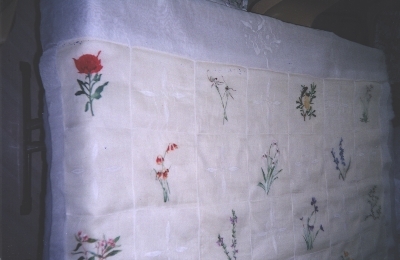 Wholecloth quilt in white cotton voile with alternating designs of Australian wildflowers worked in multi coloured cottons and shadow work. It is backed with yellow voile. There is no padding. This Adelaide Chronicle wildflower quilt was made by Miss Ida Summers in South Australia c.1933. It was later owned by Mrs. Jennifer Alde and is now in the collection of The Embroiderers' Guild of SA Inc. Museum. "Miss Ida Summers worked for Jean Mattic of Terowie S.A. in the 1930s on a sheep station. Among her duties she helped the children with their correspondence lessons. During the war she joined the Air Force. She learnt painting/pencil and wash from Ruth Tuck." Quilt made from furnishing materials some with mettalic flecks. It is machine sewn. Quilt made of tailors' swatches, machine constructed around a central frame that is mainly mid brown pieces. This is surrounded by rectangles of mainly charcoal greys and the outer border is navy blues. The backing is a heavy cotton with random green and cream and grey stripes. Utilitarian quilt. The padding is pieced used clothing and possibly reused blanket. The top and backing are machine pieced cotton scraps in a wide variety of pattern and colours. Log Cabin quilt made from a variety of cottons and silks. There is no padding and the backing is calico bags. 1500 x 1250 mm. Wholecloth quilt covered front and back with the least worn parts of old curtains. The padding is a carded wool sheet from Ipswich Woollen Mills placed between layers of cheesecloth.